Hi! I’m Gertie! 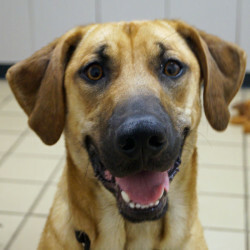 I am one year old, and I was surrendered to the Monmouth County SPCA because I was too active for my family. I would really love to go to a home that likes to exercise with their dog. I love to be busy and active! I’m very playful, and I love attention. I like toys and balls and will throw them around to amuse myself. I know “sit”, “down”, “stay”, and “come”, and I’ll “shake”, too! I like belly rubs and to play other dogs!